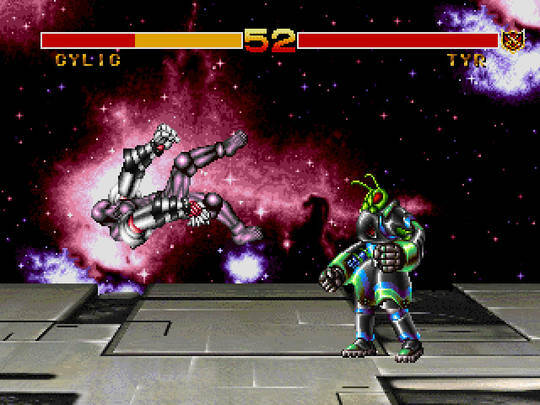 Cosmic Carnage is a one-on-one fighter that's exclusive to the Sega 32X. There's eight fighters and you can choose to play either the CPU or a friend. Each matchup consists of a best of three and your basic attacks include Normal or Fierce punches / kicks, as well as character specific special moves. The game's main gimmick is the ability for half the roster to wear light or heavy armour that can be selected for the body, legs and arms prior to each fight; this armour can be damaged and interestingly the amount you have left during battle dictates the types of special moves you can use. This is a great idea for deeper customisation / strategy and allows these characters an additional three attacks to battle with; oddly though, the other half of the roster have to deal with a greatly reduced move set without any upside. The game does feature a nice mixture of close combat and long-range attacks, but there's barely any memorable moves and little to distinguish each character's unique fighting style. The game also suffers from elaborate control inputs and overly fussy button timings, making some attacks too tricky to pull off in the heat of combat. Most of the fighters have zero personality (the only one who's even remotely compelling is Naja with her tail whip that gives her a huge reach advantage) and the stages suffer from dull backgrounds and uninspired scenery. The two player mode is just as boring, and annoyingly the game doesn't let you change characters until after you've been defeated. Graphically, there are some cool scaling effects where the action zooms in and out depending on character positioning, but there's little else that couldn't have been done on 16-bit hardware. While Cosmic Carnage does show promise in its large move sets and innovative armour system, everything is so poorly implemented that it ends up being an extremely average fighter. Add to this the weak character rosters and mundane stage design, and you have all the makings for an instantly forgettable game. Random trivia: The game was rushed to release in order to be a Sega 32X launch title.